Russian regional carrier Severstal Airlines, which is owned by steel and mining giant Severstal, has taken delivery of its first Superjet 100 and entry into service for its initial Russian regional jet is planned for early 2019. 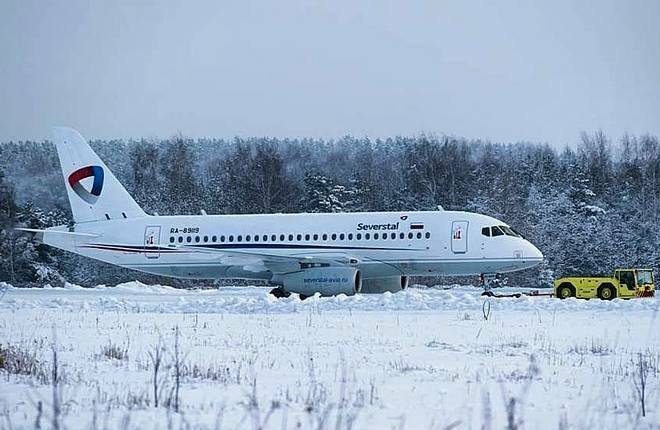 The aircraft, with registration number RA-89117, was delivered to the airline on December 26 and is currently at its Cherepovets home base airport. It features a convertible cabin, which affords seating capacity adjustments, and offers between 100 single economy class seats, or a two-class 93-seat configuration with eight in business. The company’s SSJ100s are being taken on a 12-year term financial lease from State Transport Leasing Company (known by the acronym GTLK), Russia’s largest leasing company. GTLK is to deliver three more Superjets to Severstal within the period 2018-2019. The airline also has an option for another two aircraft. Russian regional jets are to replace airline’s entire fleet of ageing Bombardier CRJ200s. Severstal’s order is for the SSJ100 B100 version with the more powerful SaM146-1S18 engines for improved runway performance. The airline also plans to retrofit its SSJ100 fleet with blended winglets (nicknamed saberlets), which are currently being tested by the aircraft’s manufacturer Sukhoi Civil Aircraft Company (SCAC). Severstal is poised to be one of the early operators of the saberlets-equipped Superjets. The arrival of the Russian-made aircraft in the Severstal fleet renewal programme will stimulate passenger traffic growth, it is hoped. The airline currently operates six 50-seat Bombardier CRJ200s and one 32-seat Yakovlev Yak-40. In 2017, the Cherepovets-based airline carried some 240,900 passengers, up 4.3 per cent on the previous year. Severstal Airlines, a subsidiary of steel and mining giant Severstal, which is majority-owned and controlled by Russian tycoon Alexey Mordashov, performs domestic and international scheduled and charter flights across Russia, the CIS countries and also to Europe.